Telefonat publike ne rruge po dalin jashte perdorimit. Vetem ne New York ka mbi 13.600 cope qe pothuajse nuk perdoren fare. Arkitekti John Locke i Departamentit te Permiresimit Urban ka marre persiper ta ktheje kete problem ne dicka te dobishme. 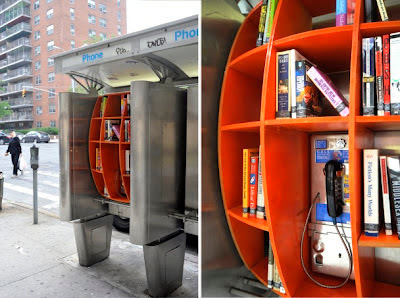 Ai po 'ngacmon eksperiencen urbane' duke ripershtatur kabinat telefonike ne biblioteka te çastit. Kjo nderhyrje perdor strukturen ekzistuese te kabines pa e prekur fare aparatin telefonik, dhe raftet e vendosura mund te hiqen menjehere pa problem. Payphones are becoming obsolete. 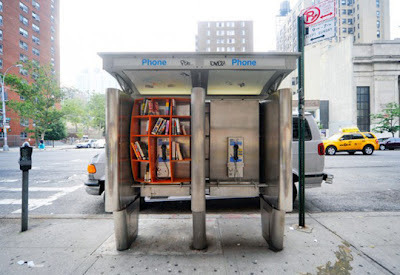 In New York City alone there are over 13,600 hardly used payphones. Architect John Locke of Department of Urban Betterment has taken this problem and turned it into an opportunity. He has 'hacked the urban experience' by repurposing the phone booths into pop-up libraries. The intervention uses existing construction without affecting the phone itself, and the shelving can be easily removed. Per nje interviste te plote me njeriun prapa ketij eksperimenti shkoni ketu. For a full interview with the man behind this experiment go here. Si mendoni ju, mund te bejme dicka te tille ketu ne Shqiperi? A nuk mendoni se do te jete e dobishme per te gjithe, sidomos per ata qe lypin dhe flene ne rruge? What do you think, can we try something like this here in Albania? Don't you think it will be beneficial to everyone, especially to adults and children that beg and sleep on the streets? Promovimi i nje literature te hapur mund te jete po aq e rendesishme sa qasja dhe shperndarja e informacionit. Vetem nje ide. Me poshte jane disa foto te kabinave telefonike ne Tirane. Si mund te shihni disa prej tyre jane tashme duke u perdorur nga shitesit ne rruge. Promoting an open-source literature might be as important as information sharing. Just an idea. Here are some photos of payphone booths in Tirana. As you can see a few of them are already being used by street vendors.